I realize this is an old AVR, so I'm not going to write an extensive review. I'll just say that I picked this up from the big auction site a few years ago to use as my bedroom system and it more than exceeded my expectations. The sound is very nice, the auto-calibration worked very well, it had plenty of connections (no HDMI of course) and plenty of clean power. I had a TV, media player, and blu-ray connected to it in a 5.1 speaker configuration. My main reason for writing the review is that I was browsing and came across the negative review that says the phono input is not useable. This is clearly operator error. I used the phono input and it was in fact quite good for an AVR. This is actually one of the receiver's strengths. If you are thinking about getting into vinyl, this AVR has a pretty decent phono stage. The built in phono stage is designed for moving magnet (MM) cartridges, which most entry level turntables have. If you try to connect a phono stage or step up transformer (SUT), or a turntable with a built in phono stage to the phono input you will be amplifying the extremely low input signal of the turntable twice, which will result in horrible distortion. If you already have a phono pre-amp or SUT then you would use any of the other available RCA inputs. The phono stage is not suitable for MC cartridges, you would need a pre-amp or SUT for a moving coil (MC) cartridge. Flexible setup for anywhere from 2 to 7 speakers plus subwoofer. Included mic makes setup a breeze. Menus are a little extensive. Programming the remote took some time, but it's easy to use once setup. Let me say first off, this thing is powerful! Everytime I turn it on, my lights flicker, and they're not even on the same outlet, AND they have a power conditioner between the lines. I was in the market for a quality receiver that would be used mainly for movies, with occasional two speaker music being played. I initially was leaning towards the Yamaha 1500 or 2500 receivers, but after going in and listening to them side by side with the Denon, I had to go with Denon. The sound just seemed much more "together" coming from the Denon. If you like to hear each individual instrument and have it seem like it's coming from a different place, then maybe the Yamaha would suit you better. Personally, I was amazed at the wall of sound that came at you when this Denon was hooked up to the same speakers. Many people say this remote is complicated, but in actuality it's very simple. Another bad thing I've heard about it was that the display was blurry. I haven't experienced this at all, so I'm thinking maybe it was just a problem with the very first models off the line. The included microphone makes setup very easy and the only adjustment I had to make was some additional volume to the subwoofer. I can easily change the settings on the fly, whether I'm watching DTS, Dolby, or just listening to music. Even my girlfriend has started to figure it out. Whatever source is providing the sound, the receiver remembers the last settings from that source and automatically switches it's settings to match. I'm very pleased with this product, and for the money I couldn't find anything that came close. It's important to note that if you buy it off of the internet, Denon doesn't honor their normal warranty unless it's through one of their approved sellers, and you'll normally be being close to $1000 US if you buy through them. This didn't bother me at all, as the quality in this product is very obvious and the seller offered a 1 year warranty on it themselves. Audio performance - simply Stunning. Good looks. Video facilities - not appropriate for the UK market. No up/down conversion on the VCR output. Can't use line-level turntables with the Phono input. I won't bother reviewing all the specs - which you can look up! I'll just concentrate on the good/bad things that have impacted me most. Setup was not as complicated as I'd feared. The manual is quite straightforward (although the English in it leaves a little to be desired!) but naturally I wouldn't expect my mother to be able to set this up. The auto-setup using the microphone was amazing I thought, quite spooky how it manages to measure the distance so accurately! My aims for purchasing this unit were to have high-quality audio from my hi-fi components, Sky digibox, DVD player, and games consoles - and simplifying the connections and switching as a by-product. And hopefully simplifying the video connections too. I had my heart set on Denon as I've had a Denon separates system for 8 years and been extremely impressed, and the AVR series always get rave reviews. I wasn't disappointed with the audio performance. I'd never heard TV and music sound so good. I spent a good weekend rediscovering some old favourites! 5 channel stereo is revolutionary, and the surround performance is breathtaking. Once you have the balance and levels set correctly, the speakers just disappear and you get enveloped in the sound which . Bass is powerful and clean, high frequencies are crisp. However, I could not get my turntable to work with the Phono input. The sound was horribly distorted. The manual says that magnetic cartridge level signals are not supported and that a step-up amplifier must be used. Well, that's exactly what my turntable is...it has a built-in amplifier terminating in RCA plugs for plugging into a line-level input. It does however work in any other input on the AVR-2805, such as CD. I wrote to Denon, wondering if I had a faulty unit, and they replied that it has a built-in amplifier and I shouldn't be trying to connect a line-level signal of 1-2 volts into an input that only expects mv's! Well hang-on, it doesn't accept MC level signals, and it doesn't accept line-level signals either?? Denon seem to have invented their own standard for turntables! Unless I'm missing something, but as far as I know all turntables that you can buy these days are either MC level or line-level. Anyway, I'm now using the turntable on the VDP input - for Vinyl Disk Player! Onto the video side of things. I knew beforehand that the AVR-2805 did not have RGB or SCART support, but I thought/hoped that the S-video and up-conversion it performs would suffice. Whilst what it does is very clever, I find it's not actually working for me. S-video is certainly nowhere near as good as the RGB I'm currently getting from my Sky box and DVD player, and it won't handle the widescreen switching signals. And since the only place where conversion is not performed is on the VCR out terminals, you have to plug in all of composite video, S-video and component if you are likely to want to record from any source, so complicating the connections, or you have to resort to the lowest common denonimator which is composite. I also have a strange problem whereby plugging in both composite and S-video from the Sky box produces picture distortion. I have decided not to use the AVR-2805 for video, as it provides an inferior solution to that of my £10 SCART switch box. If this was an audio-only box, I would have given it 5 stars. As it's marketed as an AV solution and places so much emphasis on video processing, I have to mark it down severely for the video side as it just doesn't work for the UK market. It might be different when using component video, however there are precious few devices using that at the moment and I'm certainly not likely to get anything of that nature in the near future. BTW This is the first review I've written and have only just realised what the star ratings mean. A 3 means "fair deal". A 2 means "not completely happy". Bear that in mind when seeing my ratings! Features, auto calibration and wattage for the price, though you might get what you pay for as I've seen most these units go for around $700. Extremely bright in 2 channel direct mode, with no obvious benefit in imaging. Front panel display is cheaper than the original 2800, with the illumination appearing "foggy" from any angle or distance. I recently demo'd this product looking to replace my old Denon 2800, and had been told that this newer model sounded much better than it's predessessor. With that, I did an A/B comparison of the two, with most listening done in "Direct" mode off of my Rotel cd player in stereo. I must first preface my comments here by saying that I'm uncertain what "burn-in" time is necessary for receivers in general. With that, my overall impression of this model was that it was very bright and somewhat harsh compared to the original 2800, which I had also found out was somewhat bright after replacing my old monster cable setup with tributary cables and a PS Audio LAB power cable off of my Rotel, all run through monitor audio silver series speakers. I ultimately returned the receiver after 3 days of comparison as I saw no obvious benefits over my old 2800 which I was looking to replace, and I would say it's fair to surmise that the 3805 is relatively similiar in character to the 2800 in both sound and performance, given their build similiarities. I cannot comment regarding home theatre playback, as that was not my concern. It's not that I don't have use for home theatre, as I certainly do, but I'm certain the 2805 would perform as well or better than the original 2800 in this regard. But when it comes down to two channel listening, you definitely can start to pick apart the faults of a number of receivers if you have fairly good source units, speakers and cables. This has become a nerving lesson demoing this unit, as well as a Rotel 1056 which I will be posting a review on as well. Ultimately I ended up taking a risk and ordering an Outlaw 950/7100 pream/amplifier combo with no refund on the $135 shipping involved. After a day of burn in I felt further searching was no longer necessary, the Outlaw was the obvious choice, abeit at a larger hit to my wallet (and one listen to it in home theatre DTS mode was unbelievable compared to my original Denon, and safe to say the 2805 wouldn't have come close either). To be fair, one might consider the 2805 and the Outlaw rig to be in two different classes as well. At this price I cannot fault this 2805 in anyway form or fasion. Kudo's to Denon for such a great offering at such a low price. "WHAT's NEXT"
Main Speakers switch off when subwoofer is turned off in PURE DIRECT MODE. I would be nice to be able to select different Crossover points for each channel instead of defaulting to one for all channels. Please forgive me for any errors I may make during this review. I am not an english major, but I will try my best to be clear. Also I will not cover all the Denons capabilities as there are to many. 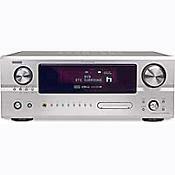 I recently purchased this Denon AVR-2805 to replace my very good Denon AVR-2802. My reasons for replacing the AVR-2802 were that I needed more component video inputs and I liked all the outsanding extra features this new AVR-2805 has to offer. I really didn't need the power of the more powerful receivers as I am already the proud owner of two ATI-2505 amplifiers. The ATI-2505 amplifers are each powering my left and right main Home Brew speakers that are of very high Quality as well as my Home Brew Subwoofers. I use an Madisound 24CX-4 active crossover Manufactured by TDM-Design in Oregon State For TRI-AMPING. This is a Very quiet and transparent X-over. My left, right, left rear and left rear right surround speakers are also Home Brews but having passive Crossovers. I am Using two M&K S1B speakers as my centers powered by an excellent Harmon Kardon PA-2400 Power Amplifier. I have owned this HK about 8 years and has served me very well. Getting back to the AVR-2805. When first hooking up this I found hooking it up to be very strait foward as I was already familiar with the 2802. setup was also quite simple using the supplied MIC and the auto setup. Once the auto setup was finished and all the inputs were assigned I began to listen. I was very surprised by how much different it sounded compared to the AVR-2802 when using the Direct Pure Mode. It was, from what I could hear to be more detailed but also a bit harsh or overly bright sounding in the upper frequenzies. This disapeared after several hours of used. Imaging is so darn good the I am always checking to see if my center speakers are playing. To me this is quite impressive. The Auto Setup adjusted the distance of all the speakers to perfection as well as the output levels. The other great thing is the auto setups ability to equalize all the speakers in my setup using it't 8 band per channel parametric equalzer. This is incredible! This actually adjust your speakers for your rooms acoustics. When playing back in any source you can opt to listen without the EQ or select from NORMAL, FRONT, FLAT, MANUAL-which is user preference settings using the also provided 8 band per channel Graphic EQ. The AVR-2805 remembers your last setting for every mode. I have found the "FLAT" setting to be by far the best EQ setting although my main speakers have a bit warmer sound with no EQ at all, but the Flat setting reveals more detail in every source so it has become my favorite overall even in Pure Direct Mode. Did I mention the Dolby PL-IIx. You will be in for a real treat while watching movies and listening to music. Select "MUSIC" mode when listening to music, you will be impressed at the excellent job this does. Music has never sound good with Dolby until now, at least that is my opinion. Seven channel stereo is also excellent once the rear speakers are faded out abiet from the original Denon 2805 auto setup setting. Don't be afraid to play with the settings and adjust to your own tastes. I DON'T Recommend messing with the PL IIx Cinema or the Dolby Digital settings, they are from what I experience to be spot on. The steering is also outstanding. IF YOU DO MESS THINGS UP, NOT A PROBLEM. Hook the MIC up and do the auto setup again. Auto setup takes less than five minutes. One problem I did find is when in Pure Direct Mode when I turn the Subwoofers down all the way to the "OFF" it allso turns my main speakers off. THATS JUST NOT RIGHT! The Remote takes a little getting used too. I am used the remote that came with my AVR-2802 but after a few days of using the 2805 remote I really leaned to appretiate it though, both funtionally and egonomically. The only real downside is the lack of backlighting and very small print, but once you learn the functions, the color coded keys are a big help in guiding your fingers to the correct keys. Also access to all the loudspeaker and surround settings is a breeze on the remote via the lower keys on the remote as is the display on the receiver quite visible from an distance. I could spend hours writing about this 2805 receiver but I don't have any more time. For those interested in this Receiver don't hesitate. This recever is and excellent bargain.As a PRE PRO as it is mostly used as in my system it sounds as good as any seperates I have ever owned an maybe better including My old Proceed PRE. I also own an Transcendent Sound Grounded Grid Tube Preamp which I swap in and out from beween the Denon Left & Right preamp outputs and the 24CX Crossover. I love the sound of the Grounded Grid but the Denon also sounds so good on it's own. The Denon AVR-2805 is only powering the 4 surround speakers. not the mains or center. Time to go, I hope this is helpful. 2 ea. ATI 2505 Sony DVP S9000ES Philips DVD 963SA Transendent Sound GG Tube Preamp and and endless amount of other equipment over the past 25 or so years. The sub level from the auto set-up was way off but easily fixed. Binding post need to accept bare speaker cable in a better fashion. More Co-ax digital inputs. More solid feeling Volume knob (I'm being really picky). Well, after a long and hard look at the state of Sub AU$2000 HT recievers in Australia I finally landed my sights on the 2805. Let me explain why: I've been a Yamaha fan for two generations of my HT set-up, but the only flaw I have found that is consistant (IMO) with Yamaha gear is 2 channel "good old fashion" Hi-Fi. I listened to gear within my budget for shop to shop and many different suppliers. HT processing and effects steering with most brands are the same, good amplification helps of course. 7.1 and auto room set-up is pretty common on above $1500 recivers these days too. The Denon is above par though in these areas with great OSD and calibration that does a better job then my ears and an SPL meter. But what set it apart was 2 channel reproduction. Dropping a CD and listening in Pure Direct mode was VERY impresive. I was also impressed with LP Play back using hi-res format material like SACD and DVD-A. The control and grip was better then Yamaha, Pioneer, HK and Onkyo. I haven't fully explored the video side of the amp yet really, only using the composite video out dosen't really allow the amp to flex its muscles in that regard (got to test it out when i get a projector) The 2805 makes me very happy, it took a good 2 days to wear in, a top end harshness was present right out of the box but has totally passed now. A word to the wise, good cables are a must signal, speaker and power all need to be top notch, with a solid foundation the 2805 will keep the most picky HT fan or HT/Audiophile happy for a long time.